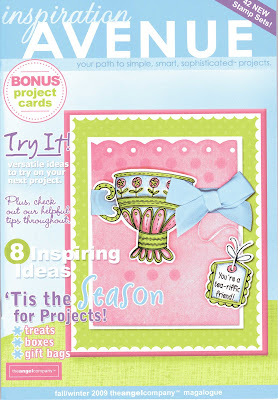 The Angel Company's newest magalogue release Inspiration Avenue is now available!! I just received my copy today!! It is filled with 42 brand new sets! There are holiday sets (Thanksgiving, Christmas, Halloween & even a must-have Valentine's Day set!! 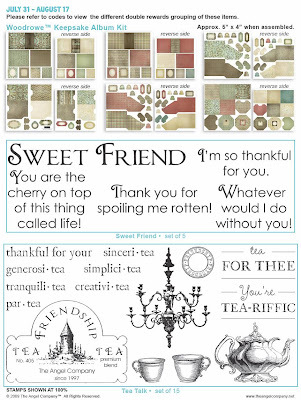 ), there are sets for coffee & tea lovers, for bird lovers, lots of holiday & general sentiment sets both for the inside and outside of cards or for use in scrapbook pages. There's a snowflake background stamp that is another must have!! And, can I let you in on a secret? I was asked to design some samples! I worked with 3 of the new stamp sets, all Christmas related. I have 2 samples in this magalogue and one will be available as a download on TAC's homepage!! It's a mini-ornament box. How fun is that!! I put a little glass ornament inside the box and filled the box with eyelets, brads, rolls of ribbon, buttons, etc. It makes a fun little gift for a scrapbooking/rubber stamper friend or for a hostess gift! Or, use it as a decoration on your Christmas tree! I'll share some pictures of that at a later date. I am going to show you a sample that didn't make into this magalogue. Maybe it will help get you excited about the possibilities of what you could do with this set! This set is called "Good Tidings" and is a set of 7 for $21.95. 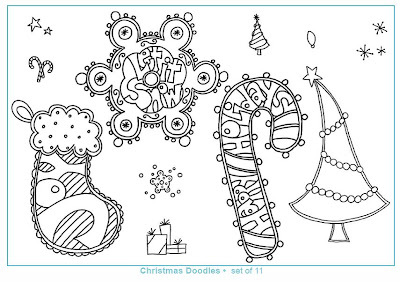 GREAT set for making your holiday cards. The paper I used is from TAC's Willoughby Paper Pack. The ink is Hint of Pesto VersaMagic (if I remember right). NOW is the perfect time to host a FUNSHOP!! Hostess benefits are doubled!! PLUS, you get additional bonus items!! 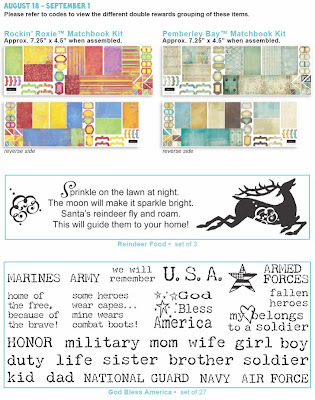 Your guests will be able to choose stamps and supplies from 3 current publications, one that has stamp sets perfect for their holiday cards!! Call or email me if you are interested!! Here's a card that we made at our Open House a few weeks ago. I added "bling" in the form of a sparkly gel pen to the eyelids & hooves of the cow. The cow spots in the background are from the "Spring Time" set and are actually made for a tree. Laurie had the great idea to use them as a cow background! I stamped the spots with VersaMark Dazzle to add an extra little glitz to the card. The inside of the cards says, "It's just another birthday." This is another sentiment that is included in the set! Don't want the whole box? Why not split a box with a friend or two!! You open the box together and each choose something and continue taking turns choosing what you want until the box is empty!! 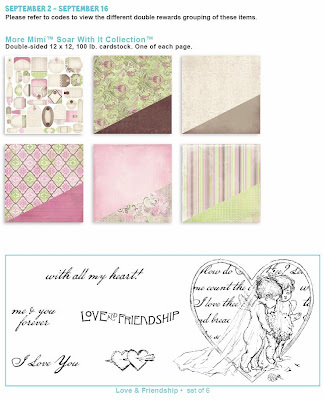 What a GREAT way to get papers, embellishments, etc for such a LOW, LOW price!! Oh, and did I mention that these boxes may contain stamp sets as well?? Oh, and did I also mention that SOME boxes will contain GIFT CERTIFICATES for stamp sets from the current catalogues!!! YEP!! GIFT CERTIFICATES...as much as $100 worth in ONE box!! What a deal!! Oh, and did I also mention that if you buy one of the boxes, you are only $25 away from qualifying for hostess benefits and DOUBLE AWARDS!!! So, instead of one free hostess set, you could choose TWO. And, instead of one half price item, you could choose TWO!!! And, it just keeps getting better!! TAC is offering additional rewards during the first 6 weeks of the Double the Fun promotion!! See the chart shown below! This is the PERFECT time to schedule a funshop or place an order!!! Call or email me to get your SURPRISE BOX...only while supplies last so you better act fast!!! Thank you so much to everyone who voted for my brother's photography entry in the KC Union Station Art Exhibit. Guess what?? HE WON the People's Choice Award!! I am so excited for him! As promised, I do have blog candy and I'll be back to post the winner of that soon! If you would like to see his winning photo, click here. And, to see his name listed as the winner, click here. His name is Travis Roth. I LOVE this Level B Hostess set Floral Fruits!! Here's another fun card I made using this set tonight. It's another quick and easy one!! Instead of stamping the cherry part of the stamp, I used buttons from the Buttons & Blossoms packs for the cherries! I LOVE how it turned out! I used the same color scheme as I did the other day for the cherry card. Well, I hope you enjoyed it!! I'm sure you'll be seeing a lot more with this set in the days and weeks to come! Thank you so much for those of you who have voted for my brother!! You are AWESOME!! As promised, I have blog candy for those of you who leave me comments and let me know you voted! For every vote you give my brother, if you post a comment on this post here, I'll add your name to the drawing that many times!! AND, if you tell other people by posting on your blog, I'll add your name an additional 5 times!! If you haven't voted yet and would like to be eligible for the blog candy, go to this website and when you see the gray box at the bottom of the post enter "U6". That's all there is to it! Come back here, let me know you voted for my brother Travis & you'll be entered in the drawing for the blog candy to be given away on August 9th. Here's some closeups of the blog candy. Thanks again for helping my brother & I out!!! I love the new Level B Hostess set "Floral Fruits"! It is soooo cute!! It can be yours FREE with a $250 funshop or order!! I made a super, super quick card using this set tonight. I'm not real crazy about this card, it is very plain but it is still fun...after all it has polka dots!! I think I might redo this one later on, but for now it'll do. You have to make sure to enter the "U" as an uppercase U. "U6" that 's all you have to enter!! "Good morning! I need to ask each of you a favor: Vote for me, then tell everyone you know to vote for me as well. It’s that simple. You can only vote once per computer, but that doesn’t mean that you can’t vote from work, vote from home, vote from your BlackBerry, and then vote from the PC of that coworker that never locks their computer when they get coffee. Please follow the link below and then click "On Display – Visual Arts Exhibition". The number for my picture is "U6", so enter that code (including the uppercase "U") in the "Other" box and click vote. If you actually want to look at my picture, then you can do that as well, just don’t be lured in by any of the other pictures. If I end up soliciting your vote for someone else, I will find you and it will not be pretty. Anyway, thanks for your vote(s) and the vote(s) of everyone you know! Vote now because we both know that if you don’t do it now, you’ll forget. Thanks!! Let me know if you vote FOR HIM by commenting on this post and I'll enter you into a special drawing for BLOG candy!! AND, if you vote more than once or EVERY DAY (hehe!!) or on other computers (!!!) comment each time on this post and I'll put your name in the drawing for every vote you send my brother's way!! Now, be sure to vote for "U6" or it doesn't count!! I'll announce the winner at the end of the contest which is August 9th. I'll post a blog candy post soon but I know it will include a stamp set, some ribbon and other misc!! 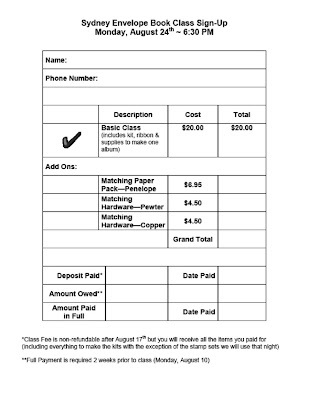 You can choose to add matching paper & hardware to the class cost to give you more decorating options! This class combines both rubber stamping & scrapbooking and will introduce you to the Bind-it-all machine! If you need a gift for a grandparent, friend or relative this is a great gift idea and a perfect keepsake album with minimal work! When you are finished with this book, you will probably have enough pieces left to make another book at home if you wanted to. You'll also most likely have left-over pieces after decorating your book that you can use on other projects, including extra ribbon. If you would like to add products that match this kit and not have to think about what matches and what doesn't, you have the option of adding extra supplies on to your basic class fee. This includes the matching Penelope Paper Pack ($6.95), Matching Pewter Hardware ($4.50) and Matching Copper Hardware ($4.50). These are all additional options and are not required. The pictures you see on this post are samples of some of the pages from the book I made. Don't forget that the deadline to register is August 10th and payment is required at that time!